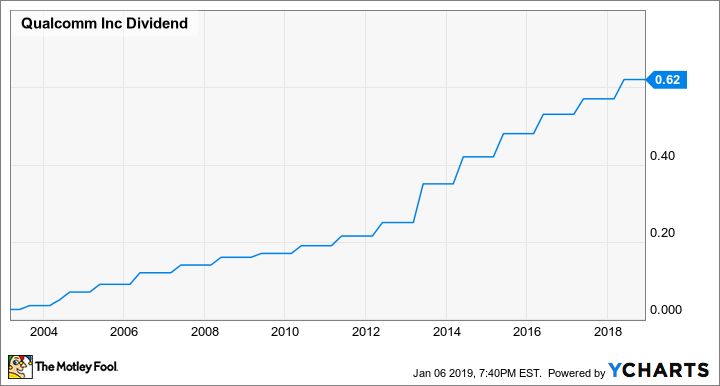 Will Qualcomm Raise Its Dividend in 2019? One thing potential investors in Qualcomm (NASDAQ:QCOM) stock might find attractive is that the shares currently offer a substantial dividend yield of 4.38%, making it one of the largest among semiconductor stocks. Admittedly, one of the factors that has contributed to Qualcomm stock offering such a large yield is that the stock itself hasn't been a great performer. It's off significantly from its peak and was a pretty poor performer in 2018. With that being said, if you're new to the stock, or you're a long-term shareholder and dividend increases matter to you, you'll probably want to know the answer to the following question: Will Qualcomm raise its dividend in 2019? I think the answer to that question is yes. Here's why. Although past performance is no guarantee of future success, companies that value their dividend programs strive to increase their dividends each year, if they're able to. Not only do dividends contribute to a company's total stockholder return, but a company that pays a substantial dividend and has a history of increasing it each year is more likely to be on the radar of investors who value income and dividend growth versus a company that delivers more sporadic increases. Right now, Qualcomm's lucrative wireless technology licensing business -- known as Qualcomm Technology Licensing, or QTL -- is under pressure because Apple (NASDAQ:AAPL) refuses to pay. The two companies are currently engaged in a bitter legal battle, and although Apple's refusal to pay has wrought havoc on QTL, Qualcomm has managed to get a few good punches in recently, as well, as Apple has been forced to remove its older iPhone 7 and iPhone 8 from sale in Germany. Qualcomm is not without its challenges to face, but if you're a believer in the Qualcomm story, and the prospect of dividend growth is important to you, then you needn't worry -- the company's track record and its current financial performance all but guarantee that a dividend increase is on the way soon. The company has already paid out three dividends at the $0.62 per share rate, so while I don't think we'll see a dividend increase the next time the company declares its dividend (that should be sometime in January based on historical trends), the dividend should see a boost a quarter after that, when the company declares its dividend in April of 2019.